The killer forehand isn't just about physical size and strength. Look at this young guy below on the right. Right now he's four feet tall, but he's got the proper technique and the proper fundamentals to give him a big, powerful forehand. Yeah, he's a little guy, but he's got the makings of a big killer forehand. Technique, not size, is the secret of the Killer Forehand. We're going to show you all the ingredients necessary to develop the killer forehand. We'll show you the correct techniques for both movement and for the stroke. You'll learn the pros and cons of the various grips, how to create an athletic foundation for better power and balance, first step reaction technique, all about footwork strides and footwork patterns, and you'll learn early and correct racquet preparation. We'll analyze the various hitting stances, your swing line and increasing your racquet speed, and We'll also look at the benefits of using the opposite arm. You'll learn a new technique called hip loading and how to properly recover after the stroke. Each of these areas are vital to the development of the killer forehand. In addition, you'll see how we have trained some of the top players in the world at the academy, players like Xavier Malisse, Tommy Haas and Elena Bovina. Your killer forehand is going to be steady. The mentality's going to be that you're not going to miss it. You're going to hit it and hit it and hit. The Killer Forehand is steady. You're going to hit it and hit it and hit it. You're going to use your feet, your movement, your mentality. Everything we'll show you is building up to give you the biggest killer forehand possible. So let's get started. It all starts with the grip. When I first began teaching the game of tennis, there was one or maybe two ways to hold a grip. Today, it's very different-you have a wide range of options--and grip has a major bearing on your style of play. 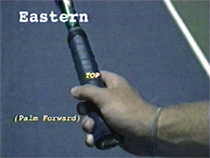 There are three commonly used grips on the killer forehand. The Eastern, the Semi-Western and the Full Western. The Eastern grip is very versatile. It offers great power and spin and can handle balls in any part of the strike zone. 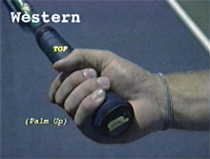 The Semi-Western grip is a popular pro grip. It produces power and spin with balls higher in the strike zone. The Western grip is very comfortable on higher balls. It produces heavy spin but lower balls can be difficult. Whichever grip you choose, stick with it. It will take months of practice before you develop a reliable forehand. Just how tightly do you hold the racket? Actually, you should hold it very loosely, just tight enough to keep it in your hand. Grip the racquet as you normally would and take a look at your fingertips. If you see them turning white, you're gripping too tight. If you hold it too tight, that means your body's becoming tight, your arm becomes tight, you lose flexibility. Let your hands work, let them be free. Your athletic height is about a foot less than your standing height. If I've said it once I've said it a million times, the killer forehand starts with a strong foundation. A strong foundation starts with a ready position that allows you to be strong in all your movements and all your strokes. Your ideal athletic height will be approximately one foot lower than your standing height. That means that if your normal standing height is six feet, your ideal athletic height would be around five feet. Your hips are dropped down to a low center of gravity and a wide base to allow you to react and move to various positions on the court. Like a downhill skier, lowering your hip position, or center of gravity will improve your quickness, power and stability. The athletic trainer promotes a strong foundation: low center of gravity and a wide base. The athletic movement trainer regulates the height of your center of gravity as you practice, building into habit the correct body position and footwork. It makes you keep your body down and utilize the legs. It allows you to develop all the qualities needed like a good, strong posture and back position. For more info on the trainer, developed by Pat Dougherty at the Academy, Click Here. Adjusted specifically to your height the bungee cord will resist and remind you when you were using incorrect technique. In match play, you should play every point as if you were wearing the athletic movement trainer. We work and work to get that strong lower foundation. Why? Strong down below, strong up above. And that's the key: to have a perfect lower foundation that allows you to use the upper part of the body. Let's work on the first step reaction footwork and find the proper technique to go from rest into motion. The drop step gives you explosive movement for difficult balls. For extreme court coverage, you need an explosive reaction. The drop step and drive footwork proves quickest on all types of surfaces for getting to difficult balls. By shifting your weight off the outside foot and tucking the driving foot under your torso, your body weight provides traction, much like a front wheel drive car in the snow, using the weight of the engine to give the tires traction. In one quick move, the drop step establishes upper body momentum in the direction you need to move. When the ball's only three or four steps away from you, you won't need such an explosive reaction. The weight shift and drive footwork is effective for less challenging balls. There are lots of parts is developing the killer forehand and an important part is timing. As soon as the ball leaves the opponent's racquet, that's when the preparation starts. And remember, you can't prepare too soon. You can't prepare too soon to hit the Killer Forehand. To improve your reaction time, try this. Have your partner on the other side and when they make contact with the ball, say the word "ball". When it's your turn to hit it, say the word "hit". Not only will this put you in better position to hit more killer forehands, but it's also going to improve your reaction time and anticipation skills. In interviews, I always get the same question: what do you look for when you're looking for a possible professional player? I'll tell you what I'm looking for. In order to have a killer forehand, you better have quick feet. You have to spring on that ball like a tiger. If your heels are touching, you're in 10th gear. Like riding in first gear on a bicycle, your first two to five steps have to be quick for maximum acceleration that will help you run down difficult balls like the wide angle shot. The gears of a bicycle are a good comparison to footwork strides in running. When you run, first gear footwork consists of short, powerful strides, the feet pumping quickly. Tenth gear footwork, are long, big reaching strides good for maintaining speed but not quick on acceleration. For maximum acceleration getting to the difficult balls, use first gear footwork. First gear sprint footwork is always on the balls of the feet. If your heels are touching the ground in the first two to five steps, you're in tenth gear. Several footwork patterns are commonly used and can be considered the dance steps of tennis, allowing great players to appear as if they're floating or gliding around the court. The crossover step allows for fluid side to side movement, quickly moving to and from the ball. The cross behind step, which will be moving to the side and back as well as in recovery. The shuffle step covers short distances well. The adjustment steps are vital to fine tuning your balance and positioning in your hitting stance. Have your coach watch your head as you move side to side. If there is excessive bobbing up and down, you're not gliding, you're wasting energy. One of the trademarks of a great athlete is the ability to move with footwork as graceful and smooth as a dance. So that's Part 1 on the Killer Forehand. If you learned something, stay tuned for Part 2.